Don’t let the condo board tell you otherwise. You have every right to put any dish or antenna smaller than one meter (39″) wide on your balcony or in any other reasonable area. It’s called the OTARD rule and while that’s a funny name that invites all sorts of inappropriate jokes, it’s a serious thing cooked up by the FCC to protect you from rental offices, condo boards, and homeowners association. 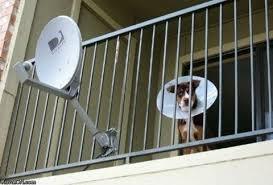 If you have exclusive use of an area, like a patio or a roof you don’t share, you can put your dish or antenna there. It doesn’t give you the right to use a common area like an open patio or park, or to attach to light poles or other city structures. If you don’t use any nails or other fasteners, then you don’t need permission. As stated before the dish or antenna must be under one meter in size and installation must not cause any damage to the building. This is an FCC rule. This means that it cannot be overriden by an HOA, condo board or rental office, no matter what they tell you. However it can be overriden by local laws. There are very few cities that have anti-antenna laws so for the most part that’s not a problem. If you think that you’re being unfairly kept from putting your dish or antenna up, you can start by calling the FCC at 1-888-CALL FCC (1-888-225-5322). You can also fill out a form provided by the SBCA (Solid Signal is a member) by clicking here. The SBCA is an organization of satellite broadcasters and dealers dedicated to training and informing. to try to help you understand the protections you’re entitled to. Don’t be discouraged! The law is on your side!